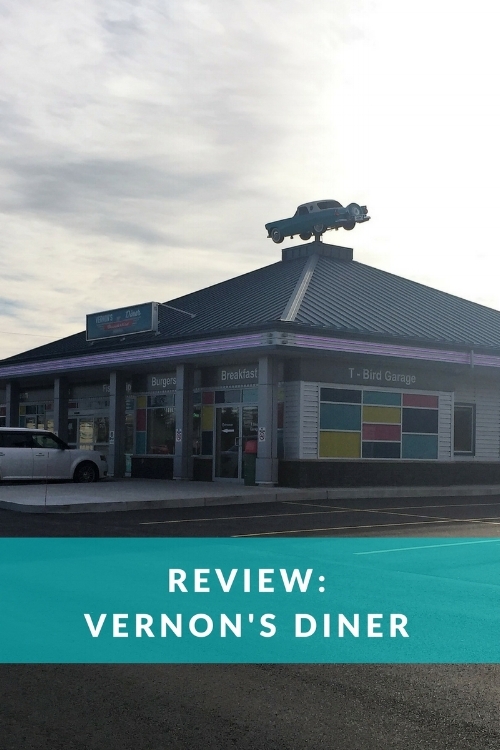 After running some Sunday morning errands we found ourselves hungry in Hammond's plains so what better time to finally get to try out Vernon's cafe for some breakfast. This 50's style diner is a work of art. You can tell the owner spared no expense with this design. Everything was planned out to the tee. It's been a while since I've been to a brand new building with a brand new restaurant (While we frequent new establishments often- there's something about a fresh building) There wasn't a thing out of place, a scuff on the floor/ walls. No rips in the seats or chips in the table and the place was CLEAN, it was an absolute breathe of fresh air! Showcased on the roof and in the main entrance as you come in is 2 beautiful vintage T-bird cars. The breakfast menu is a one pager, and prices are good. The food came very quickly and was very tasty. I would have loved there to be more spices on the potatoes but that is really my only critique. The waitress made her way over to check on us multiple times during our visit. The space was new, clean and well lit. There was fun music which was low enough that it wasn't annoying but you could still hear it. Nothing negative to say about the overall atmosphere. The host was on point, the server was on point. My coffee cup was never empty for long and the server wasn't afraid to give us recommendations. Bonus points for the fact that everyone seemed genuinely happy to be there. I would have really liked some spices on the potatoes but other than that everything was great. We were in and out within 30 minutes from when we sat down and left. The food was fast and hot and the server checked up on us many times. Cost in ratio for quantity and quality was great. It's not exactly a hop skip and a jump from our house in Dartmouth but for anyone in Tantallon/ Bedford area this is an easy stop for a good meal. Parking was awesome. Lots and lots of parking.